This world exclusive Bullet designed kit is perfect for the Landcruiser owner who tows or uses their vehicle for off road workouts. The Positive displacement Supercharger system has been developed with reliability being the main focus. Small boost levels of only 5 psi allow the engine to comfortably perform without stressing internal components, whilst delivering exceptional power and torque increases. The Supercharger delivers maximum boost from “off idle” all the way to the engine redline. This means that instantaneous Torque is available down low where you need it – when taking off from a standing start with a heavy load or caravan on the back or when in low range on a sandy beach or in boggy mud. The standard Toyota factory headers are very restrictive and a good increase in power and torque can be achieved with the Bullet Ultimate Exhaust system. These stainless steel exhausts have been thoroughly tested for engine light problems and utilise the latest in C.T.B (Ceramic Thermal Barrier) coatings to minimise under hood temperature. From the laser cut flange plates to the chrome tip, the entire system is fully mandrel bent utilising all the factory mounting points on the vehicle. This means that there are No chassis modifications needed to fit the exhaust to the vehicle. 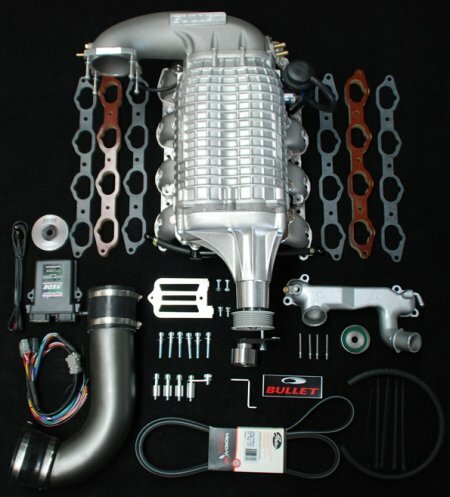 The XEDE processor allows fine tuning of the engine to match the characteristics of the supercharger. This ECU piggybacks with the standard factory ECU, which still controls all factory idle and warm-up settings. This ECU comes with a base program that will allow you to wire it in and drive the vehicle to your nearest tuning facility for fine tuning as well as a dash mountable switch that allows dual map switching for different fuel octane ratings (95 or 98). No engine internal modifications needed to realise Power and torque increases of up to 60%.